This is Natalia Sarkissian’s second “What it’s like living here” piece. The first brought us the shocking news of her son’s illness. This one delivers the aftermath, hope and dogs and gorgeous cityscapes from Milan. The alarm rings in the pearly gray of morning. White sheets—from a transatlantic trip to Macy’s in Boston—slide like silk as you stir, your dreams of sand and sun on the Sound dispersing with the squeal. You reach out an arm. You fiddle with a button. Silence ensues. You blink in the shadowy room. 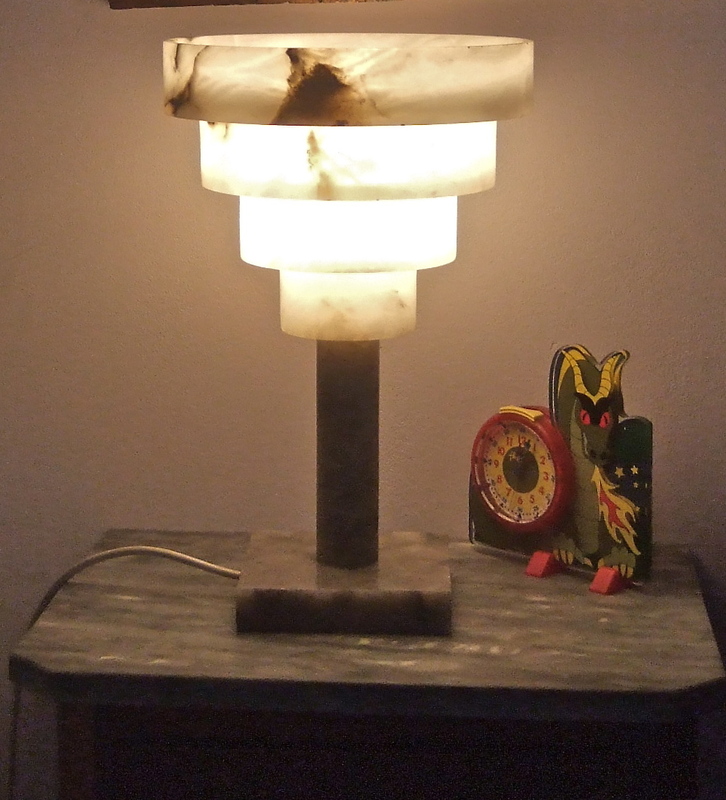 Then you light the alabaster lamp from Volterra, the one you bought on sale years ago when Rinascente department store revamped and unloaded merchandise—60% off. Now a milky glow shines encouragement on your side of the bed. Don’t move quite yet. Study instead the India-ink drawings of cocktail parties and frivolity facing you—the ones you sketched when you were twenty and going to be a painter. Then contemplate the alcove where your desk sits piled with papers, the old dresser loaded with a tower of books. You’re a mother, a part-time translator, part-time English teacher and when time permits—writer—now. A translation project (small) awaits. A lesson plan (a doctor wants to converse in English for an hour) awaits too. Not much money, but at least it’s some. In the afternoon you’ll do homework with Chris. And then there’s that novel you’re writing. Slip into your jeans, your t-shirt, your sweater. Turn off the light: a mound still snores gently under the white sheets from Macy’s. Tiptoe: the mound, in the old days (how many months of joblessness is it now?) used to be up first, shaving and showering before a day directing strategic sales in a large multinational. Now, if roused, the mound remonstrates. An old-fashioned door from the twenties (two panels, with glass, bolted across the middle with a brassy lock) bars entrance to the kitchen. On the far side, a six-month-old beast whimpers and jumps and the doors rattle and shake. “Come girl,” you say, releasing your as-of-yet-un-housebroken pup from her nightly exile to the tiled floor and newspaper inside. 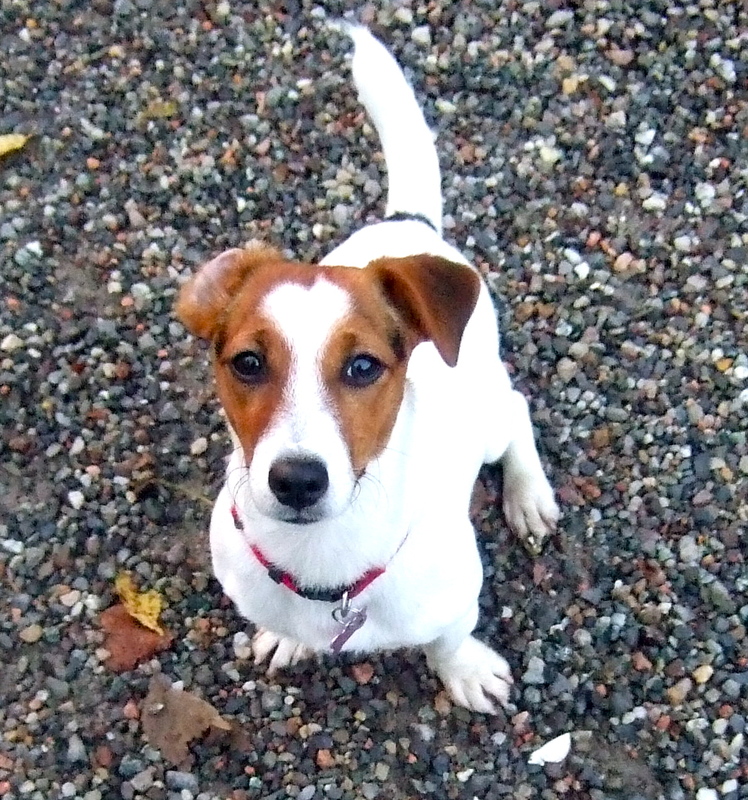 Tail wagging, she hops and jolts, somersaulting with joy. “I love you too,” you say, patting, but rushing. Bladders are small, muscles are weak, minutes are precious. Seize the leash, grab a parka, open the front door. Step out onto the marble, lock up, press the button. But then wait for the old-iron-bird-cage elevator to crank up to four. Across the landing the neighbor lady—up early too—flings her door open. Promise to clean up when you return. When the neighbor lady says, “things were fine before you went and got that dog,” and then slams her door, you shrug and step into the elevator. You know things weren’t fine before you went and got that dog. You know you went and got that dog to help things be fine. Decide you’ll walk her long and languid. A green expanse stretches from the Basilica of San Lorenzo to the Basilica of Sant’Eustorgio where, according to legend, relics of the Three Magi once were conserved. At one time infested marshlands, the land was reclaimed and fashioned into a park in the twentieth century. Students eat their lunches here on sunny days. Children swing from monkey bars in the afternoon. Along the park’s fringes, fashionable establishments serve elegant food on iron tables in vine-draped niches at midday and in the evening. You used to have aperitivi here at sunset when brick buildings glow red. You haven’t had an aperitivo here, or anywhere, in months. Nor have you watched bricks glow as the sun sinks. Nearby stand sixteen Corinthian columns, Roman ruins of the 3rd century. They were moved here in the 4th century as part of the construction project of San Lorenzo. Survivors of Roman Mediolanum, Barbarian invasions, Austrian invasions, World Wars, and urban re-edification, the columns symbolize survival against all odds. You like to walk Wendy here, in this piazza and park strewn with evidence of survival, of rejuvenation. This morning, cars rush by at 7:30, their taillights fuzzy red globes in the early morning fog. The green 94 bus wheezes along, leaving a wake that tastes of petroleum. Thick and gray it clogs your throat. You cough, cross the street, enter the park, your dog pulling on her leash, a flock of pigeons in her sights. 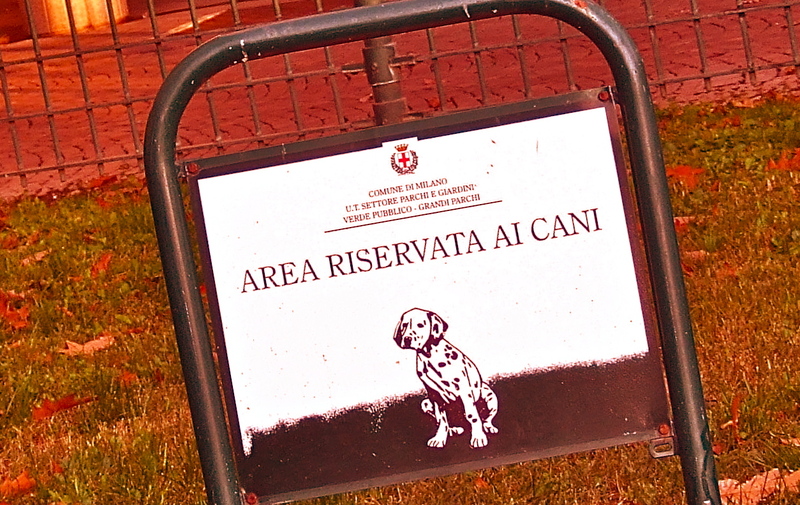 In the midst of the park of the basilicas a fence encloses trees and grass and muddy patches: a dog run. Open the gate, release Wendy. Throw a ball, toss a stick. Soon Signora Mastini and her beagle arrive. “You’re here early,” you say to Signora Mastini. You watch the dogs roll together in muddy orange leaves and enjoy their nips and jumps and yips. “Volunteer work at church today,” says Signora Mastini. “Oh,” you say, inhaling the damp smell of autumn rot. “Oh,” you say, “oh.” You zip your zipper against the chill. Then whistle. You yank Wendy away from her frolicking friend. “Come on, girl,” you say and shut the gate. You can’t afford to think about homelessness. It isn’t looming, is it? Walk. Then walk some more so you won’t think. Cut around the perimeter of San Lorenzo, then through the Carrobbio, an old intersection where the Roman Ticino Gate once stood. 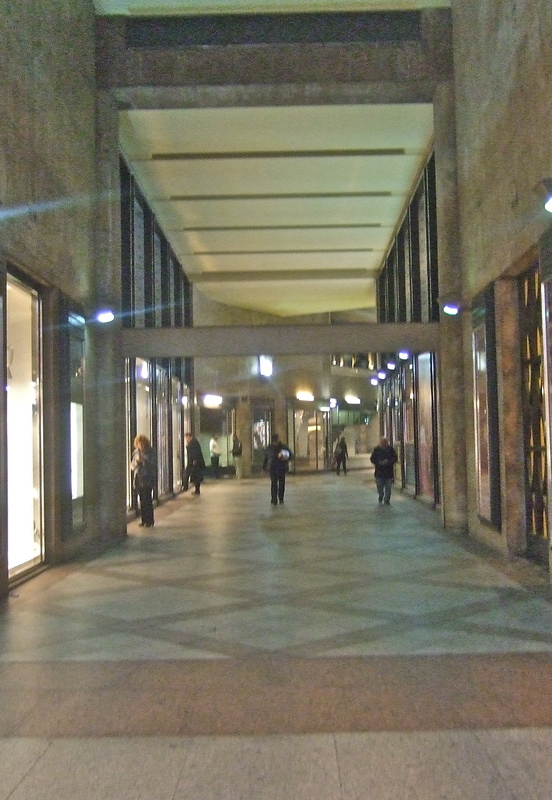 Walk north, along via Torino, a shopping artery that connects San Lorenzo to the center of town. Admire a door spray-painted by a graffiti artist but ignore the attractive shop windows up and down on either side. Forget what you don’t need and can’t have. Pause in front of S. Giorgio al Palazzo, an 8th century church, the name of which comes from a no-longer-extant Roman Imperial palace built by Diocletian. The church houses a cycle of paintings by Bernardo Luini and a late medieval relief of St. George and the Dragon. Decide to view St. George slaying his dragon. Consider it good for morale. 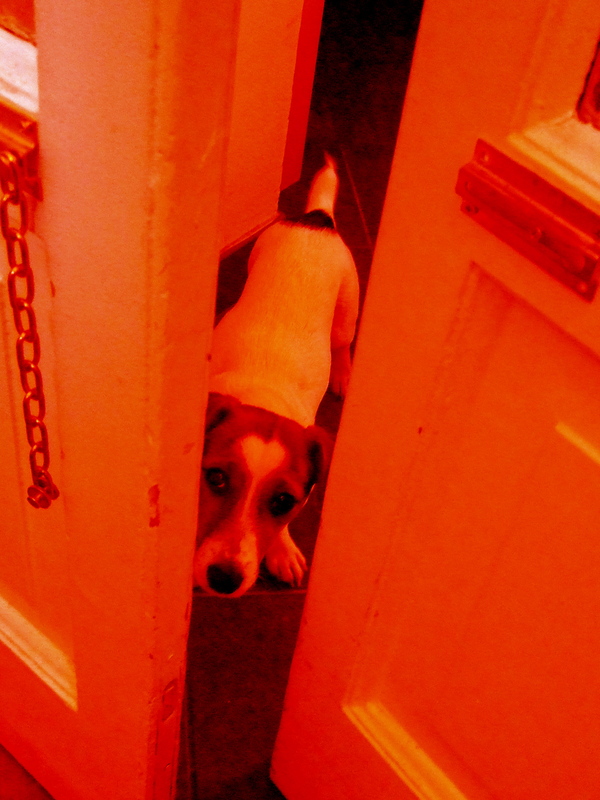 The doors are open for morning mass, but a frowning man in a cleric’s collar says you can’t enter with your dog. Even if you carry her. Even if you fit her in your bag. with deft flicks, she sends debris sliding to the gutter. Wait until she finishes spraying. Squelch past, listening to your rubber soles slapping against the wet. Then stop again. Consult your phone. The battery’s low, but still, it’s enough. Scroll and find it. Piazza San Babila, 3. Walk where your directory tells you. Piazza San Babila, with fountains and gardens, surrounded by porticoes filled with boutiques, long considered the ‘salotto buono,’ or the living room of the affluent, perches at the crossroads of the swankiest streets of Milan: Via Montepoleone, Corso Venezia, Corso Europa. 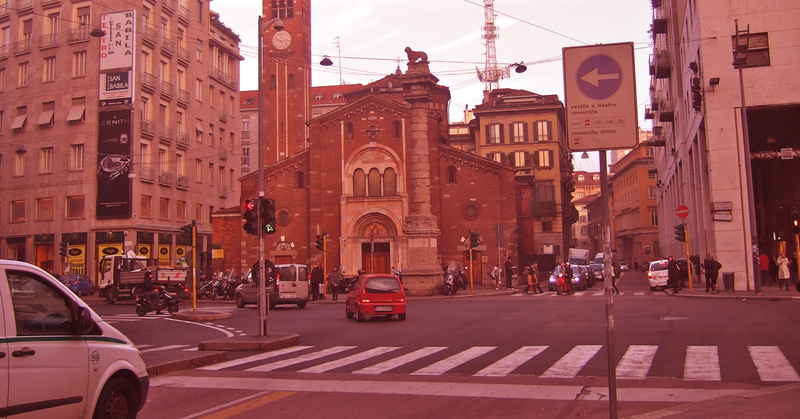 Lined with neo-fascist buildings, it’s named after the venerable brick church that oversees the bustle at one far end. Head here, to this piazza, at 9 am, your little dog following. 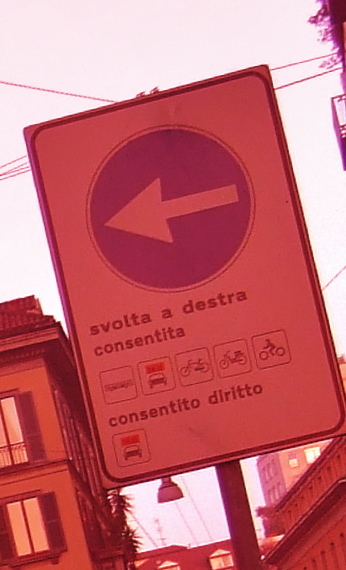 Quit Via Torino, cross Piazza Duomo, traverse the pedestrian walkway of Corso Vittorio Emanuele II, still silent, still empty of tourists and street vendors. Ignore Rinascente, Pollini, D&G as you go. Forget what you don’t need and can’t have. 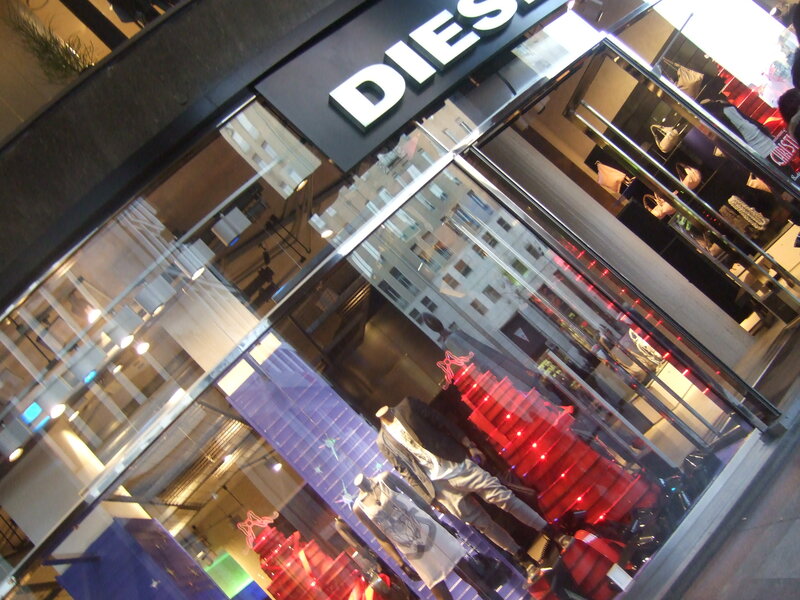 But as you near Diesel boutique, nod at a middle-aged man with a sleeping bag in a shopping cart. When he asks you for money, hand him a euro. Realize you think you’re buying distance, you think you’re buying time. You smile and nod again but he doesn’t. A few steps further, a young couple, sitting on cardboard, plastic bags filled with old clothes strewn around them, eats breakfast from McDonalds. Wendy barks and the woman spills coffee on her dirty pink track suit. “Shhh,” you say. Eyes averted, you hurry your dog past. Still further, nearing the piazza, an old man with a grizzled beard and gray hair sprawls in the doorway. Think: when the shoppers disperse, the dispossessed find a night’s worth of relief. You know that soon, when the stores open, the men and the woman will be made to move. Maybe they’ll go to Signora Mastini for a hot lunch and to fight over shoes. Rounding the corner, you’ve made it. San Babila, 3. But although you search, you can’t find the shelter you seek. The temp agency. Where your phone says it was. It used to be here. You’re sure it was here. Wasn’t it here? Hadn’t you been here, seeking a job once, not so many years ago? A fashion house occupies the offices here now. You perch on a granite bench facing a fountain to rest. You’d imagined a listing for which he was qualified. Something more substantial for you. But then, you think, maybe legwork wasn’t crazy, after all. You walked to escape when you first started out. Now you’re energized. Wendy wags her tail. She likes legwork with you. You stick her in your bag, sneak her through the turnstile, carry her onto the metro, ride the red line home. The mound is out of the bed and no longer a mound. He’s in the kitchen, making espresso. He’s bright and cheery. 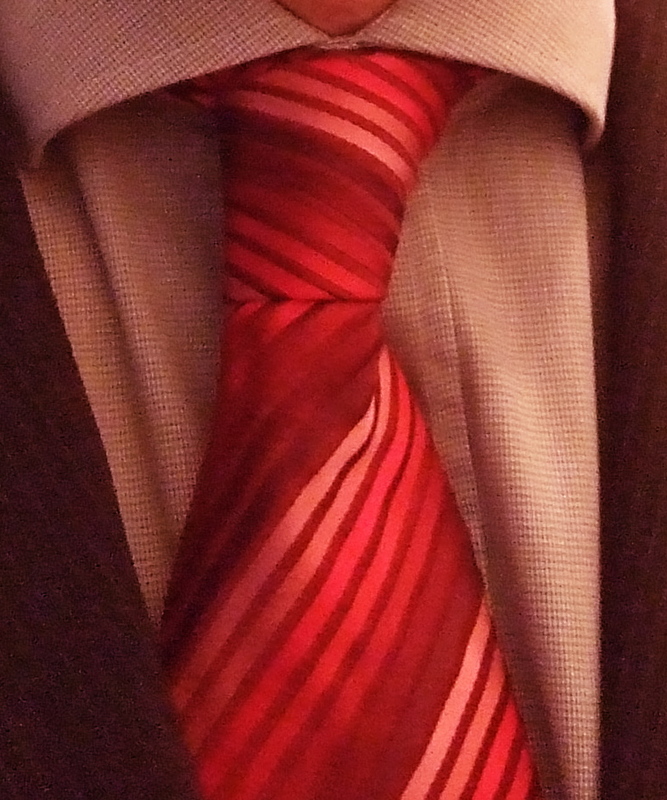 And he’s wearing a red tie. Wendy hops and jumps when she sees him and he scratches her behind the ears, laughing when her pink tongue flicks against his hand. The kitchen seems different now. Full of light, you think. “I’ve got an interview,” he says, straightening, stirring sugar, his spoon clinking against the cup. “A second interview.” He smiles. His eyes are green and his teeth shine. You don’t want to hope too much. But still, for him—for all of you—you do. First, most happy to hear the beginning news. Glad, also, for another trip to Milan. Thanks! I’ll put your name on the lamp…. Well, I didn’t mean yours. I once fell in love with a Tizio lamp, but never found the nerve and bucks. That door painting is divine, the prose haunting. A kitchen full of light is a wonderful thing. Thanks for this. Wonderful photos! Best of luck over there. Keep us posted with more beautifully-written pieces such as these, please. Love the photos. Must have been a Saturday. Who roused the teenagers for school? May I have the dog? This is lovely, Natasha! The photos, your story, the irony of the homeless finding shelter in the swishy fashion district by night. Thanks for another walk around Milan! Natasha – I missed your first post so I didn’t know about Nick’s illness. So relieved he’s OK now. And now — Cairo?!?!?! Are we going to get a What It’s Like Living in LA from you? Or what about a “What It’s Like Traveling in Colombia”? Or a “What It’s Like Traveling in Colombia”? Natalia continues to take my breath away. I can walk side-by-side as a reader, “unleashed” and be both enchanted by her willingness to show us all sides of Milan, her private life, the language. Wherever she and her family may go, hope is alive! Thanks for your kind words everyone!!! Thanks Lené, your words mean alot.